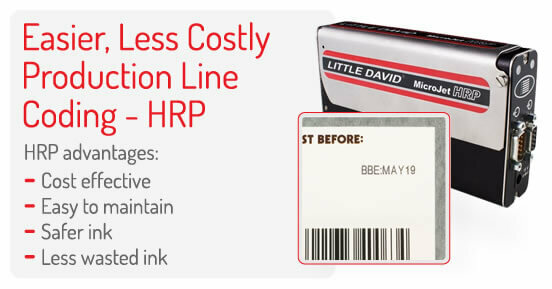 Our advanced HRP Microjet printer is the new cost effective and easier to use alternative to Continuous Inkjet (CIJ) coders. It is an ideal choice for production line coding functions such as ready-meal sleeve and carton type date coding. Our HRP coder uses an oil-based ink that is easy to clean, safer and allows the coder to be switched off and on without fear of print heads being blocked. This means no maintenance time and lower ink consumption. It also means that we can produce more cost-effective machines, Our HRP coder is more than half the price of equivalent CIJ machines.